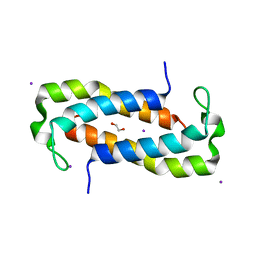 Cite: 1.52 Angstrom Crystal Structure of A42R Profilin-like Protein from Monkeypox Virus Zaire-96-I-16. 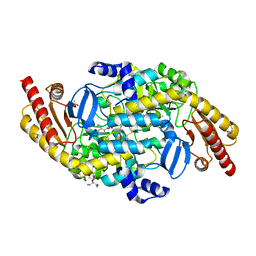 1.88 ANGSTROM RESOLUTION CRYSTAL STRUCTURE OF HYPOTHETICAL PROTEIN JHP0584 FROM HELICOBACTER PYLORI. 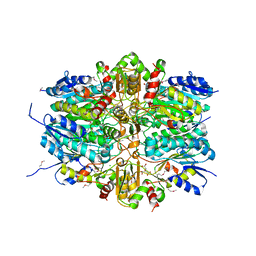 Cite: 1.88 Angstrom Resolution Crystal Structure of Hypothetical Protein jhp0584 from Helicobacter pylori. 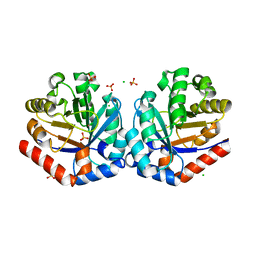 1.55 ANGSTROM CRYSTAL STRUCTURE OF N-ACETYLMURAMIC ACID 6-PHOSPHATE ETHERASE FROM YERSINIA ENTEROCOLITICA. 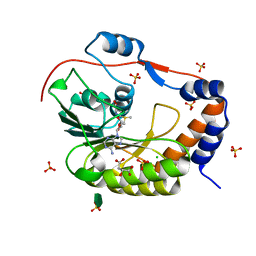 Cite: 1.55 Angstrom Crystal Structure of N-acetylmuramic acid 6-phosphate Etherase from Yersinia enterocolitica. 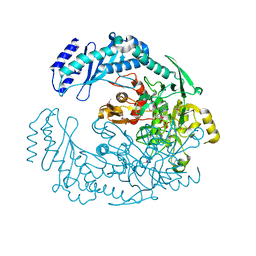 Cite: 1.7 Angstrom Crystal Structure of of Putative Modulator of Drug Activity (apo- form) from Yersinia pestis CO92. 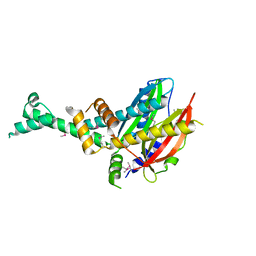 Cite: 2.95 Angstrom Crystal Structure of the Dimeric Form of Penicillin Binding Protein 2 Prime from Enterococcus faecium. 1.5 ANGSTROM CRYSTAL STRUCTURE OF SHIKIMATE DEHYDROGENASE 1 FROM PEPTOCLOSTRIDIUM DIFFICILE. Cite: 1.5 Angstrom Crystal Structure of Shikimate Dehydrogenase 1 from Peptoclostridium difficile. 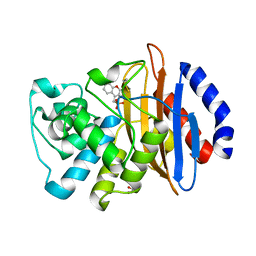 2.3 ANGSTROM CRYSTAL STRUCTURE OF THE MONOMERIC FORM OF PENICILLIN BINDING PROTEIN 2 PRIME FROM ENTEROCOCCUS FAECIUM. 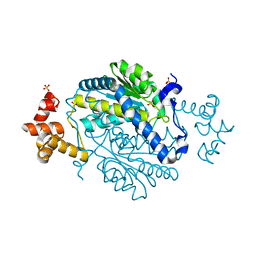 Cite: 2.3 Angstrom Crystal Structure of the Monomeric Form of Penicillin Binding Protein 2 Prime from Enterococcus faecium. 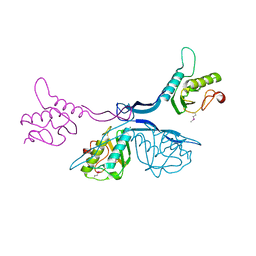 1.52 ANGSTROM CRYSTAL STRUCTURE OF FC FRAGMENT OF HUMAN IGG1. 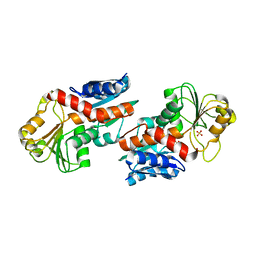 Cite: 1.52 Angstrom Crystal Structure of Fc fragment of Human IgG1. 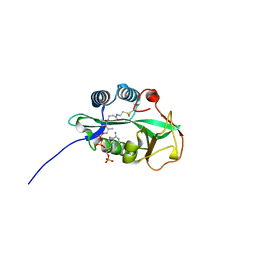 1.9 ANGSTROM CRYSTAL STRUCTURE OF NS5 METHYL TRANSFERASE FROM DENGUE VIRUS 1 IN COMPLEX WITH S-ADENOSYLMETHIONINE AND BETA-D-FRUCTOPYRANOSE. 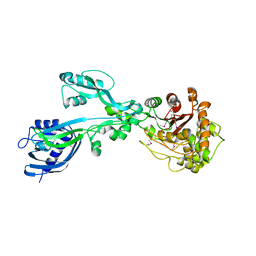 Cite: 1.9 Angstrom Crystal Structure of NS5 Methyl Transferase from Dengue Virus 1 in Complex with S-Adenosylmethionine and Beta-D-Fructopyranose. 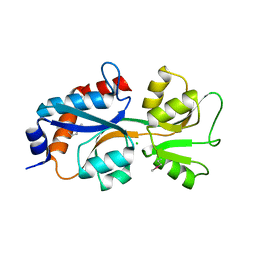 1.50 ANGSTROM CRYSTAL STRUCTURE OF C-TERMINAL FRAGMENT (RESIDUES 322-384) OF IRON UPTAKE SYSTEM COMPONENT EFEO FROM YERSINIA PESTIS. 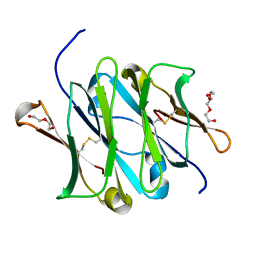 Cite: 1.50 Angstrom Crystal Structure of C-terminal Fragment (residues 322-384) of Iron Uptake System Component EfeO from Yersinia pestis. 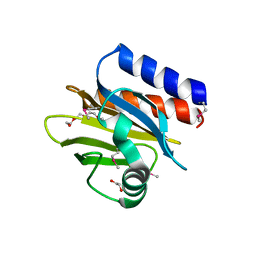 Cite: 1.9 Angstrom Resolution Crystal Structure of dTDP-4-dehydrorhamnose Reductase from Yersinia enterocolitica. 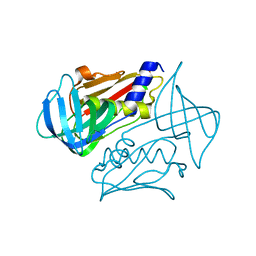 2.75 ANGSTROM RESOLUTION CRYSTAL STRUCTURE OF ACETAMIDASE FROM YERSINIA ENTEROCOLITICA. 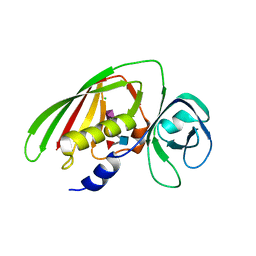 Cite: 2.75 Angstrom Resolution Crystal Structure of Acetamidase from Yersinia enterocolitica. 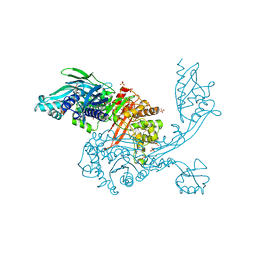 1.95 ANGSTROM RESOLUTION CRYSTAL STRUCTURE OF FRAGMENT (35-274) OF MEMBRANE-BOUND LYTIC MUREIN TRANSGLYCOSYLASE F FROM YERSINIA PESTIS. 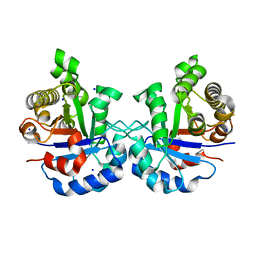 Cite: 1.95 Angstrom Resolution Crystal Structure of Fragment (35-274) of Membrane-bound Lytic Murein Transglycosylase F from Yersinia pestis. 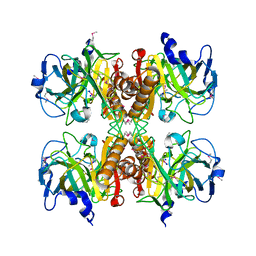 2.05 ANGSTROM CRYSTAL STRUCTURE OF RIBULOSE-PHOSPHATE 3-EPIMERASE FROM TOXOPLASMA GONDII. 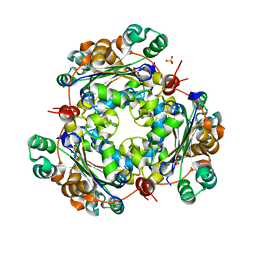 Cite: 2.05 Angstrom Crystal Structure of Ribulose-phosphate 3-epimerase from Toxoplasma gondii. 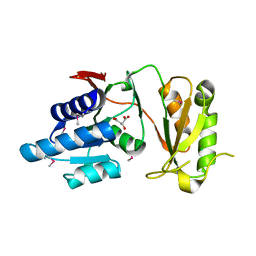 2.4 ANGSTROM RESOLUTION CRYSTAL STRUCTURE OF PUTATIVE NUCLEOSIDE DIPHOSPHATE KINASE FROM TOXOPLASMA GONDII. 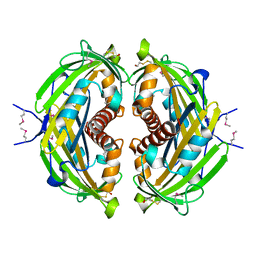 Cite: 2.4 Angstrom Resolution Crystal Structure of Putative Nucleoside Diphosphate Kinase from Toxoplasma gondii. 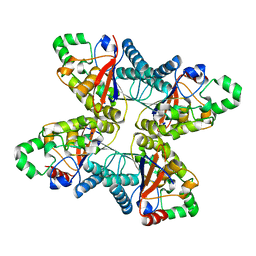 Cite: 2.6 Angstrom Crystal Structure of Putative Phosphoglycerate Mutase 1 from Toxoplasma gondii. 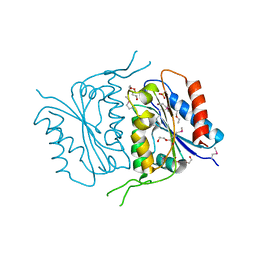 Cite: 1.55 Angstrom Crystal Structure of GNAT Family N-acetyltransferase (YhbS) from Escherichia coli in Complex with CoA.